Derive useful insights from your data using Python. Learn the techniques related to natural language processing and text analytics, and gain the skills to know which technique is best suited to solve a particular problem. 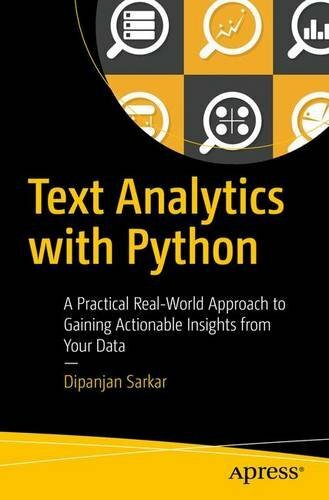 Text Analytics with Python teaches you both basic and advanced concepts, including text and language syntax, structure, semantics. You will focus on algorithms and techniques, such as text classification, clustering, topic modeling, and text summarization. A structured and comprehensive approach is followed in this book so that readers with little or no experience do not find themselves overwhelmed. You will start with the basics of natural language and Python and move on to advanced analytical and machine learning concepts. You will look at each technique and algorithm with both a bird's eye view to understand how it can be used as well as with a microscopic view to understand the mathematical concepts and to implement them to solve your own problems. What you will learn: • Natural Language concepts• Analyzing Text syntax and structure• Text Classification• Text Clustering and Similarity analysis• Text Summarization • Semantic and Sentiment analysis Readership :IT professionals, analysts, developers, linguistic experts, data scientists, and anyone with a keen interest in linguistics, analytics, and generating insights from textual data.